Decided to get back into riding. 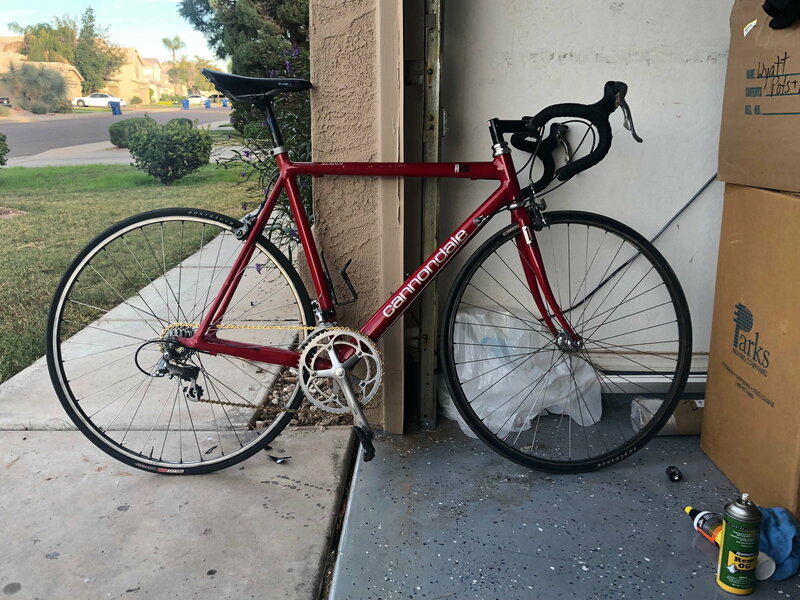 Cleaned up my 1993 Cannondale R900 and went for a 12 mile ride, safe to say I'm out of shape. But not the bike. Anyways joining to learn and see what I can upgrade on the bike to get it running better as I run better. Tried to post a pic, guess I'm not allowed to yet. Welcome to Bike Forums, 86az1351! Love the R-series Cannondales. Thanks! I've had it now for 13-14 years. And it seems to out-perform most in the sub $2k price range. The only thing I think I want to do is maybe go with a lighter and more aerodynamic wheelset. Welcome to the Form..you will find a lot on "Dale" owners here myself included...I love my Black Lightning. Welcome to Bike Forums from a fellow Cannondale owner! Welcome. I also love those Cannondales and had a R 900 once. Yeah, you’ll need 10 posts to add a pic. But please do show us the bike when you hit 10. Well here it is. Almost all original except for the seatpost and chain. Shifters were replaced with new old stock of the same Shimano tri color ultegra shifters. Wwwwwonderful bike! It's as new, congratulations! I like my old cannondale and I like this bike. It looks great. You should check out the C&V section; there is a thread there for older cannondales. I've tried keeping it as original as possible except for the gold chain. Had to have some bling. I think I'm going to look at another bike to put less miles on it. I want to keep it for another 30+ years. What! Vintage. Pshh. Only 25 years old lol. I'm not a huge Cannondale fan (though I did build an '87 factory custom painted Competition ST for my wife, which I think is "sub-zero-cool"), but that example is lovely. That colour paint is just gorgeous. Some ivory bar tape would put it over the top. Nice bike! Oh, excellent suggestion! That would, indeed, be a gorgeous tweak.